When running a store on EBay the reality is that there’s a good chance that many other sellers will deal the same products as you. Some of them are even occasional sellers and they will likely sell the item at a cheaper price; others will be high volume sellers like you and, they may also practice the same price as you or sometimes-even lower. Overall there’s likely a large amount of items being sold on EBay on your market niche and, as a seller, you’ll have to go the extra mile to be on top of the search results when buyers look for your type of items and help making them choose you instead of the other sellers. EBay offers a boost in exposure for listings that have free shipping; buyers also have the option of filtering their search by this feature, not to mention the psychological factor. This is one important thing that buyers look at as many of them want to get their item fast. EBay made this a couple of years ago a requirement for the top sellers looking to get the %20 off final value fees. This can be a lot of money when you sell many products. Get noticed by having a good, up to 5-6 quality pictures, preferably on a white background. Any effort made in this direction (purchase a good camera or software to process pictures) will be rewarded accordingly. Occasional sellers that practice low prices usually take bad pictures. Most buyers will go for the seller with a good pictures and, of course, a good selling record. While this may likely expose you to non-paying bidders it is well worth not to ask for immediate payment as it will encourage buyers to make multiple purchases and pay one invoice. Asking for immediate payment will have the opposite effect. Besides you can always recover your fees from not-played items by using the resolution center. Also may buyers appreciate if you give them a few days to pay. As I mentioned in my previous articles, having a good template for your listing is very important. Part of the reason for that is the opportunity of having various links that lead the buyers to other items in your store and generate traffic in your store that likely will translate in sales. You must remember that buyers are out for bargains and price reductions will always attract them. 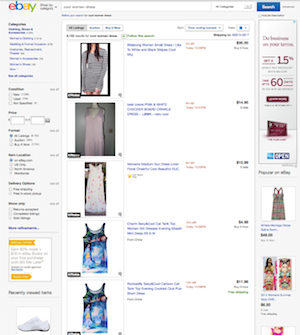 EBay offers the opportunity for the sellers to have sales for their stores and it is always a good idea to use this feature, especially when you have days when you are not able to list new items. Try to get familiar with the international shipping procedures, as there are millions of buyers worldwide that may buy the items you sell. Make sure you ship with carriers that offer online tracking and/or use insurance services. Whether you list in auction style or buy now style, having listings ending in a short period of time is a good idea when you list items that you don’t expect to restock on. This it will increase your exposure (many buyers look thru “ending soon” filter) and will make your buyers more likely to rush on bidding or buying your item. 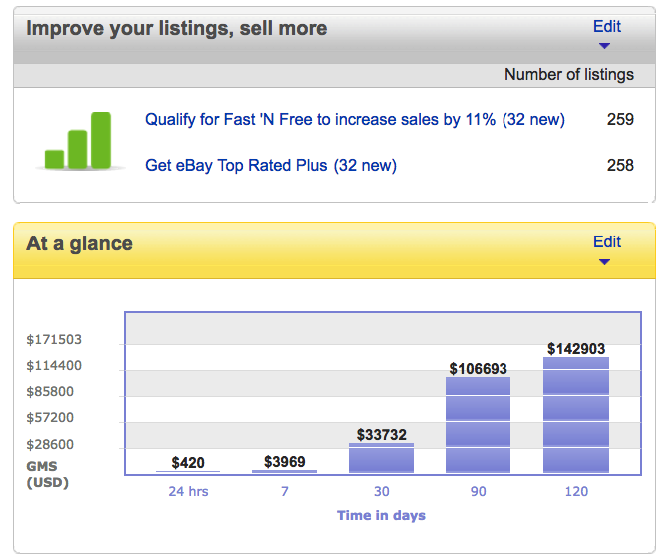 For sellers with high volume of listings EBay offers very low insertion rates (as low as 3 cents/listing when you upgrade your Selling Manager). When you list an item that you have a large quantity of, or you’re expected to restock on, it’s best to use the GTC (good till cancelled) option. If you establish a good history for your item you’ll be likely on top of your category for best match results.